Judy Murphy, RN, who served in multiple key roles at ONC including chief nursing officer, is leaving the agency on Oct. 17, national coordinator Karen DeSalvo, MD told her staff on Friday. Murphy is the latest in a string of high-profile departures from ONC. Chief scientist Doug Fridsma announced his forthcoming resignation late last month, while chief privacy officer Joy Pritts and consumerista Lygeia Ricciardi have also moved on to new ventures in recent months. Murphy has accepted the position of chief nursing officer at IBM Healthcare Global Business Services. She led the HITECH-funded program offices to achieve key milestones, such as the Regional Extension Centers providing assistance to 150,000 providers and helping 100,000 of them meet the meaningful use incentive requirements (exceeding the goal by 150 percent). DeSalvo credited Murphy with ensuring that dedicated resources were available to help 1,300 critical access and rural hospitals exceed the same goals by 200 percent. "She helped grow the MUVer (Meaningful Use Vanguard) Program to 1,000 providers and the Health IT Fellows Program to 45, giving us real boots on the ground to help providers adopt and use EHRs," wrote DeSalvo. Murphy’s CNO responsibilities will be handled by other nurses at ONC until a replacement CNO can be named, said DeSalvo in a memo to her team. Jon White, MD, will be on a part-time detail to ONC from the Agency for Healthcare Research and Quality to serve as interim lead of OCQS and serve as ONC’s acting chief medical officer, reporting to Deputy National Coordinator Jacob Reider, MD, while ONC searches for permanent staff to fill those positions. 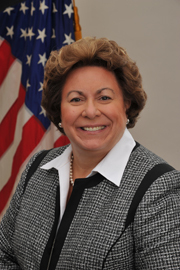 White directs AHRQ’s Health IT portfolio and will continue in that role part-time. Andy Gettinger, MD, from Dartmouth Hitchcock Medical Center, will lead the OCQS Safety team and the patient safety work for ONC. DeSalvo said Gettinger has "vast experience in many areas of health IT." Murphy received several awards spotlighting her work, including the HIMSS Federal Health IT Leadership Award, the AMIA President’s Leadership Award, and the Distinguished Alumni Achievement Award from her alma mater, Alverno College, in Wisconsin. Prior to joining ONC, Murphy worked in health informatics for more than 25 years at Aurora Health Care in Wisconsin, an integrated delivery network with 15 hospitals, 120 ambulatory centers, home health agencies and over 30,000 employees.